Roger Yonchien Tsien (Chinese: 錢永健; February 1, 1952 – August 24, 2016) was an American biochemist. He was a professor of chemistry and biochemistry at the University of California, San Diego and was awarded the 2008 Nobel Prize in Chemistry for his discovery and development of the green fluorescent protein, in collaboration with organic chemist Osamu Shimomura and neurobiologist Martin Chalfie. Tsien was also a pioneer of calcium imaging. Tsien was born in New York, in 1952. He grew up in Livingston, New Jersey and attended Livingston High School there. Tsien suffered from asthma as a child, and as a result, he was often indoors. He spent hours conducting chemistry experiments in his basement laboratory. When he was 16, he won first prize in the nationwide Westinghouse Talent Search with a project investigating how metals bind to thiocyanate. After completing his bachelor's degree, Tsien joined the Physiological Laboratory at the University of Cambridge in Cambridge, England with the aid of a Marshall Scholarship, and resided at Churchill College, Cambridge. He received his Ph.D. in physiology in 1977 for research on The Design and Use of Organic Chemical Tools in Cellular Physiology  formally supervised by Richard Adrian in the Department of Physiology and assisted by Andy Holmes, Gerry Smith and Jeremy Sanders in the Department of Chemistry. 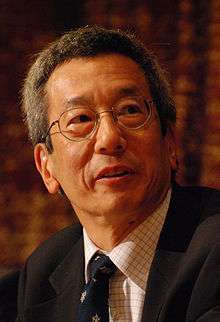 Following his Ph.D., Tsien was a Research Fellow at Gonville and Caius College, Cambridge from 1977 to 1981. He was appointed to the faculty at the University of California, Berkeley, from 1982 to 1989. Since 1989, he has been working at the University of California, San Diego, as Professor of Pharmacology and Professor of Chemistry and Biochemistry, and an investigator of the Howard Hughes Medical Institute. Tsien contributed to the fields of cell biology and neurobiology by discovering genetically programmable fluorescent tags, thereby allowing scientists to watch the behavior of molecules in living cells in real time. He also developed fluorescent indicators of calcium ions and other ions important in biological processes. In 2004, Tsien was awarded the Wolf Prize in Medicine "for his seminal contribution to the design and biological application of novel fluorescent and photolabile molecules to analyze and perturb cell signal transduction." In 2008, Tsien shared the Nobel Prize in Chemistry with Osamu Shimomura and Martin Chalfie for "the green fluorescent protein: discovery, expression and development." The multicolored fluorescent proteins developed in Tsien's lab are used by scientists to track where and when certain genes are expressed in cells or in whole organisms. Typically, the gene coding for a protein of interest is fused with the gene for a fluorescent protein, which causes the protein of interest to glow inside the cell when the cell is irradiated with ultraviolet light and allows microscopists to track its location in real time. This is such a popular technique that it has added a new dimension to the fields of molecular biology, cell biology, and biochemistry. Since the discovery of the wild type GFP, numerous different mutants of GFP have been engineered and tested. The first significant leap forward was a single point mutation (S65T) reported by Tsien in 1995 in Nature. This mutation dramatically improved the fluorescent (both intensity and photostability) and spectral characteristics of GFP. A shift of the major excitation peak to 488 nm with the emission peak staying at 509 nm thus can be clearly observed, which matched very well the spectral characteristics of commonly available FITC facilities. All these then largely amplified the practicality of using GFP by scientists in their research. Tsien mainly contributed to much of our understanding of how GFP works and for developing new techniques and mutants of GFP. Former trainees include Atsushi Miyawaki and Alice Y. Ting. 1994: Tsien showed the mechanism that GFP chromophore is formed in a chemical reaction which requires oxygen but without help from the other proteins. 1994–1998: Tsien and collaborators made various GFP mutants by genetic modification and structural tweaking. Newly created variants of GFP can shine more brightly and show different colours, such as yellow, cyan, and blue. 2000–2002: Tsien produced monomeric variants of DsRED, which can glow in shades of red, pink, and orange. Remarkably, since then complicated marcromolecular networks of living organisms can be labelled or marked by using "all the colours of the rainbow". 2002: The critical structural difference between GFP and DsRed was revealed. One extra double-bond in the chromophore of DsRed extends its conjugation thus causes the red-shift. 2002: Monomeric DsRed (mRFP) was first developed. 2004: New "fruit" FPs were generated (by in vitro and in vivo directed evolutions). In 2009, a new kind of Infrared Fluorescent Protein (IFP) was developed by Tsien's group, and further reported and described by Science. The new IFPs are developed from bacterial phytochromes instead of from multicellular organism like jellyfish. Under normal conditions, bacterial phytochromes absorb light for signaling instead of fluorescence, but they can be turned fluorescent after deleting some of the signaling parts by genetic means such as site-directed mutagenesis. In order to fluoresce, IFPs require an exogenous chromophore, biliverdin. In 2016, a new class of fluorescent protein was evolved from a cyanobacterial (Trichodesmium erythraeum) phycobiliprotein, α-allophycocyanin, and named small ultra red fluorescent protein (smURFP). smURFP autocatalytically self-incorporates the chromophore biliverdin without the need of an external protein, known as a lyase. Jellyfish- and coral-derived fluorescent proteins require oxygen and produce a stoichiometric amount of hydrogen peroxide upon chromophore formation. smURFP does not require oxygen or produce hydrogen peroxide and uses the chromophore, biliverdin. smURFP has a large extinction coefficient (180,000 M−1 cm−1) and has a modest quantum yield (0.20), which makes it comparable biophysical brightness to eGFP and ~2-fold brighter than most red or far-red fluorescent proteins derived from coral. smURFP spectral properties are similar to the organic dye Cy5. Tsien was a pioneer of calcium imaging and known for developing various dyes which become fluorescent in the presence of particular ions such as calcium. One such dye, Fura-2, is widely used to track the movement of calcium within cells. Indo-1, another popular calcium indicator, was also developed by Tsien's group in 1985. He has also developed fluorescent indicators for other bio-relevant ions such as potassium and magnesium. Aequorin is also a useful tool to indicate calcium level inside cells; however, it has some limitations, primarily is that its prosthetic group coelenterazine is consumed irreversibly when emits light, thus requires continuous addition of coelenterazine into the media. To overcome such issues, Tsien's group also developed the calmodulin-based sensor, named Cameleon. FlAsH-EDT2 is a biochemical method for specific covalent labeling inside live cells. It's a method based on recombinant protein molecules, and was developed by Tsien and his colleagues in 1998. Mouse experiments by Tsien's group suggest that cancer surgery can be guided and assisted by fluorescent peptides. The peptides are used as probes, and are harmless to living tissues and organs. Their lifetime in the body is only 4 or 5 days. Clinical trials are awaited. Tsien was also a notable biochemical inventor and holds or co-holds about 100 patents till 2010. In 1996, Tsien co-founded the Aurora Biosciences Corporation, which went public in 1997. In 2001, Aurora was acquired by the Vertex Pharmaceuticals. Similarly, Tsien was also a scientific co-founder of Senomyx in 1999. Dr. Tsien also promoted science education to promising young scientists through the first-ever San Diego Science Festival Lunch with a Laureate Program. Associate EMBO Member of the European Molecular Biology Organization 2005. According to the Qian (Tsien) clan genealogy book, Tsien is a 34th-generational descendant of King Qian Liu of the Wuyue Kingdom of ancient China. Tsien's parents Hsue-Chu Tsien and Yi-Ying Li (李懿颖) came from Hangzhou and Beijing, respectively. Tsien had a number of engineers in his extended family, including his father Hsue-Chu Tsien who was an MIT-educated mechanical engineer and his mother's brothers Y. T. Li (李耀滋) and Shihying Lee (李诗颖), who were engineering professors at MIT. Tsien's mother Yi-Ying Li was a nurse. The famous rocket scientist Tsien Hsue-shen, regarded as the co-founding father of the Jet Propulsion Laboratory of the California Institute of Technology and, later, the director of the Chinese ballistic-missile and space programs, is a cousin of Tsien's father. Tsien was the younger brother to Richard Tsien, a renowned scientist currently at New York University  and Louis Tsien, a Principal Software Engineer. Tsien, who called his own work molecular engineering, once said, "I'm doomed by heredity to do this kind of work." He was married to Wendy Tsien (née Globe). On August 31, 2016, a press release by UC San Diego announced the death of Prof. Tsien. He died on August 24, 2016. Although the actual cause of death is yet to be determined, he seemed to have died while on a bike trail in Eugene, Oregon. "He was ahead of us all," said Tsien’s wife, Wendy. "He was ever the adventurer, the pathfinder, the free and soaring spirit. Courage, determination, creativity and resourcefulness were hallmarks of his character. He accomplished much. He will not be forgotten." 1 2 3 "Roger Y. Tsien, chemist shared Nobel for tool to research Alzheimer's, dies at 64". The Washington Post. 31 August 2016. Retrieved 1 September 2016. 1 2 Tsien, Roger Yongchien (1976). The design and use of organic chemical tools in cellular physiology. (PhD thesis). University of Cambridge. OCLC 500581238. 1 2 Anon (2016). "Roger Tsien EMBO Profile". people.embo.org. Heidelberg: European Molecular Biology Organization. 1 2 "Roger Tsien at UCSD Department of Chemistry & Biochemistry" (Official web page). UCSD. 2008. Retrieved November 4, 2008. 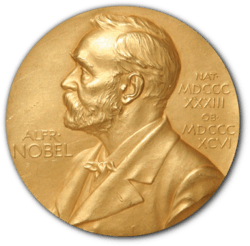 1 2 3 "2008 Nobel Prize in Chemistry Laureates" (Official web page). The Nobel Foundation. October 8, 2008. Retrieved October 8, 2008. ↑ Tsien, Roger Y. (2010). "The 2009 Lindau Nobel Laureate Meeting: Roger Y. Tsien, Chemistry 2008". Journal of Visualized Experiments (35). doi:10.3791/1575. ISSN 1940-087X. PMC 3152217 . PMID 20072108. 1 2 Rudolf, Rüdiger; Mongillo, Marco; Rizzuto, Rosario; Pozzan, Tullio (2003). "Looking forward to seeing calcium" (PDF). Nature Reviews Molecular Cell Biology. Nature Publishing Group. 4: 579–586. doi:10.1038/nrm1153. Retrieved 1 September 2016. 1 2 3 4 Nicole Kresge, Robert D. Simoni, and Robert L. Hill. "The Chemistry of Fluorescent Indicators: the Work of Roger Y. Tsien", Journal of Biological Chemistry, September 15, 2006. Accessed September 18, 2007. "At age 16, Tsien won first prize in the nationwide Westinghouse talent search with a project investigating how metals bind to thiocyanate." ↑ Swayze, Bill. "Jersey teens call science a winner: Two finalists say just being in Westinghouse talent competition is prize enough", The Star-Ledger, March 11, 1997. Accessed September 18, 2007. "Only one New Jersey teenager has ever captured top honors in the history of the competition. That was Roger Tsien in 1968. The then-16-year-old Livingston High School math-science whiz explored the way subatomic particles act as bridges between two dissimilar metal atoms in various complex molecules." ↑ "Phi Beta Kappa" (Web page). The Harvard Crimson. April 24, 1971. Retrieved October 9, 2008. 1 2 3 4 LaFee, Scott (31 August 2016). "Nobel Laureate Roger Tsien Dies, Age 64". UC San Diego News Center. Retrieved 31 August 2016. ↑ June Q. Wu; CRIMSON STAFF WRITER (October 9, 2008). "Harvard Alumni Win Nobel Prize – Three chemists share award for green fluorescent jellyfish protein" (Web page). The Harvard Crimson. Retrieved October 9, 2008. 1 2 3 "Cambridge graduate wins Nobel Prize for Chemistry" (Web page). The University of Cambridge. October 8, 2008. Retrieved October 8, 2008. ↑ Rink, Timothy J.; Tsien, Louis Y.; Tsien, Richard W. (13 October 2016). "Roger Yonchien Tsien (1952–2016)". Nature. 538 (172). doi:10.1038/538172a. ISSN 0028-0836. ↑ "HHMI Scientist Abstract: Roger Y. Tsien, PhD" (Web page). HHMI. August 20, 2007. Retrieved October 8, 2008. ↑ "HHMI Scientist Bio: Roger Y. Tsien, PhD" (Web page). HHMI. Retrieved October 8, 2008. ↑ "The Wolf Foundation Prize in Medicine" (Web page). The Wolf Foundation. 2004. Retrieved October 8, 2008. 1 2 "The green fluorescent protein: discovery, expression and development" (PDF). The Royal Swedish Academy of Sciences, Information Department. October 8, 2008. Retrieved October 8, 2008. ↑ Shaner N, Steinbach P, Tsien R (2005). "A guide to choosing fluorescent proteins" (PDF). Nat Methods. 2 (12): 905–9. doi:10.1038/nmeth819. PMID 16299475. ↑ Heim R, Cubitt A, Tsien R (1995). "Improved green fluorescence" (PDF). Nature. 373 (6516): 663–4. doi:10.1038/373663b0. PMID 7854443. ↑ "Green Fluorescent Protein: Timeline" (Web page). Conncoll.edu. 18 Nov 2009. Retrieved December 22, 2009. ↑ Xiaokun Shu; Antoine Royant; Michael Z. Lin; Todd A. Aguilera; Varda Lev-Ram; Paul A. Steinbach; Roger Y. Tsien (2009). "Mammalian Expression of Infrared Fluorescent Proteins Engineered from a Bacterial Phytochrome". Science. 324 (5928): 804–07. doi:10.1126/science.1168683. PMC 2763207 . PMID 19423828. 1 2 Rodriguez, Erik A.; Tran, Geraldine N.; Gross, Larry A.; Crisp, Jessica L.; Shu, Xiaokun; Lin, John Y.; Tsien, Roger Y. (2016-08-01). "A far-red fluorescent protein evolved from a cyanobacterial phycobiliprotein". Nature Methods. doi:10.1038/nmeth.3935. ISSN 1548-7105. PMID 27479328. ↑ Tsien, Roger Y. (1998-01-01). "The Green Fluorescent Protein". Annual Review of Biochemistry. 67 (1): 509–544. doi:10.1146/annurev.biochem.67.1.509. PMID 9759496. ↑ Miyawaki A, Llopis J, Heim R, McCaffery JM, Adams JA, Ikurak M, Tsien RY (1997). "Fluorescent indicators for Ca2+ based on green fluorescent proteins and calmodulin.". Nature. 388 (6645): 882–7. doi:10.1038/42264. PMID 9278050. ↑ B. Albert Griffin; Stephen R. Adams; Roger Y. Tsien (1998). "Specific Covalent Labeling of Recombinant Protein Molecules Inside Live Cells". Science. 281 (5374): 269–72. doi:10.1126/science.281.5374.269. PMID 9657724. ↑ "PNAS: Fluorescence + MR imaging probe can guide cancer surgery" (php). PNAS. March 4, 2010. Retrieved March 11, 2010. ↑ Barbara Bachtler (November 21, 2002). "Prof. Roger Tsien Honoured with Max Delbrueck Medal" (Web page). Max Delbrück Center for Molecular Medicine (MDC) Berlin-Buch. Retrieved October 8, 2008. ↑ "Lewis S. Rosenstiel Award for Distinguished Work in Basic Medical Science Past Winners". Rosenstiel Basic Medical Sciences Research Center. 2006. Retrieved December 31, 2009. ↑ "New Foreign members & Honorary Fellow 2006" (Web page). The Royal Society. 2006. Retrieved September 27, 2008. ↑ "Who are our Honorary Fellows?" (asp). The Royal Society of Chemistry. Retrieved December 27, 2009. ↑ "New Nobel laureate to be named honorary academician". The China Post. Taiwan (ROC). October 16, 2008. Retrieved December 27, 2009. ↑ Roger S. Dong (April 2009). "2009 AAEOY Awards" (pdf). National Engineers Week Foundation. Retrieved December 27, 2009. ↑ "Salute to Innovation" (shtml). 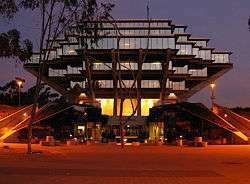 UC San Diego Technology Transfer Office (TTO). May 20, 2009. Retrieved May 20, 2009. ↑ "HKU to award Honorary Degree to Nobel Laureate Professor Roger Yonchien Tsien". The University of Hong Kong. Oct 29, 2009. Retrieved October 29, 2009. ↑ "The Chinese University of Hong Kong Holds 67th Congregation for Conferment of Degrees". The Chinese University of Hong Kong. December 10, 2009. Retrieved December 10, 2009. ↑ "PM Dr. Manmohan Singh gives away awards to prominent scientists" (asp). India Education Dairy.com. January 3, 2010. Retrieved January 4, 2010. ↑ "RSC Spiers Memorial Award 2010 winner – Roger Tsien, UCSD, USA" (asp). The Royal Society of Chemistry. 2009. Retrieved December 22, 2009. ↑ "Green Fluorescent Protein". The Golden Goose Award. Retrieved 2015-05-27. ↑ "Bowditch Award Lecture". Recipients. American Physiological Society. Retrieved March 23, 2015. ↑ 本院邀請諾貝爾化學獎得主錢永健教授12月蒞臨「中央研究院講座」演講 (in Chinese). Academia Sinica. December 11, 2009. Retrieved December 27, 2009. ↑ "Academia Sinica to welcome lectures by 2008 Nobel laureate". eTaiwan News (Central News Agency). December 11, 2009. Retrieved December 27, 2009. ↑ "The 2010 National Lecture will be given by Roger Tsien, UCSD" (aspx). The Biophysical Society. 2009. Retrieved September 10, 2009. ↑ 诺贝尔化学奖得主钱永健系吴越国王34世孙 [Nobel Chemistry Prize winner Roger Tsien is the 34th-generational descendant of the King of Wuyue] (in Chinese). Sina.com. October 9, 2008. Retrieved October 9, 2008. ↑ Ruth Williams; Horsfall, MJ; Van Helten, JB; Glickman, BW; Mohn, GR (October 8, 2007). "People & Ideas – Roger Tsien: Bringing color to cell biology". J Cell Biol. 179 (1): 6–8. doi:10.1083/jcb.1791pi. PMC 2064723 . PMID 17923526. ↑ Ma, Huan; Li, Boxing; Tsien, Richard W. (2015). "Distinct roles of multiple isoforms of CaMKII in signaling to the nucleus". Biochimica et Biophysica Acta (BBA) - Molecular Cell Research. 1853 (9): 1953–1957. doi:10.1016/j.bbamcr.2015.02.008. ISSN 0167-4889. ↑ Robbins, Gary (31 August 2016). "UCSD Nobel laureate Roger Tsien dies". The San Diego Union-Tribune, LLC. Retrieved 31 August 2016. Wikimedia Commons has media related to Roger Tsien.